Featuring a Q&A with the artists moderated by Benton Bainbridge! The global landscape of digital creation processes is shifting thanks to the flourishing and increasing diversity of workflows, pipelines and open source projects. Right now, digital artists are in an unprecedented time where tweaking the input and output from existing nodes can generate completely new visuals and concepts from currently-existing technology. Originality is becoming an even larger, more essential component of creativity and the relationship between exoteric or esoteric tweaking inside of these processes can inspire arguments regarding authenticity from some creators and critics. Some may remain optimistic and supportive of this approach, but regardless of whether one is for or against the concept, we shouldn’t be afraid to take a deeper look at the latest wave in this ongoing movement revolving around new mutations within existing landscapes. Featuring new works from artists Song.Yunling(Tracy), Cao.Yuxi(James) and Raven.kwok, AudioVisualVenue's goal is to redefine the relationships between audiences and content within the traditional theater environment. To further this new type of immersive audience experience, AudioVisualVenue is proud to present each artist's work in both the Media Center's theater and one-of-a-kind Digital Media Arts Gallery. From 7:30-8:30 PM in the theater, Yuxi.Cao(James) will demo his work that combines real-time audio interaction with a timeline-based narrative. His goal is to break from the traditional pre-rendered frames and transition to a more flexible and unique creation with the introduction of real-time content creation. With this integration in mind, the demo will show how to reduce the risks encountered when creating work in real-time while simultaneously opening up new creative possibilities for each performance. The demonstration will be followed by a Q&A with the artists moderated by Benton C. Bainbridge, a media artist whose work has been shown across 5 continents, and has also collaborated with artists including Beastie Boys, Kaki King, Pauline Oliveros, Abigail Child, Nick Didkovsky, Bobby Previte, Jin Hi Kim, and many more. Redark is an audio-visual live performance. All of the visuals are original and generated by uniquely programmed software. It is a real-time project based on Syphon and COGE software and uses sound frequency as the primary way to affect the visuals. This technology transforms our relationship to sound and images and allows us to confront an audience with an all-new experience. As a real-time composition, Redark can really make the audience a part of the performance. 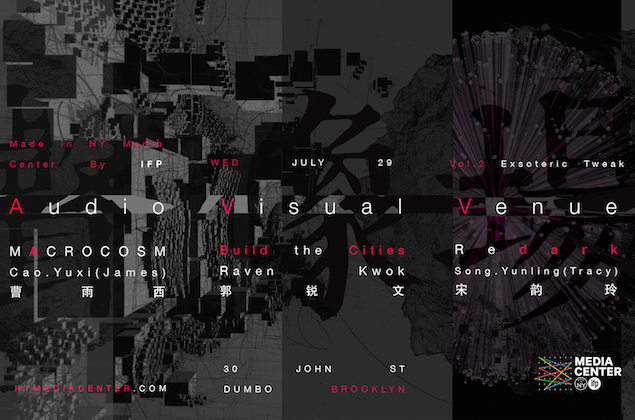 Macrocosm is a live sound visualization project by Cao.Yuxi(James) that has evolved from the artist’s own perception of the aesthetic displacement of polygons and flickering layers. The concept behind the piece is the development a constantly-evolving polygonal sphere that moves from a simple object to a complex organic creature using data context correlated to social and neutral resources. An audio visual performance piece, Macrocosm uses sound frequency data to disrupt and recreate objects through a custom live performance pipeline containing live sound detective masks generator made from open source tool processing, Vezér, a timeline trigger tool, the unity3D game engine to enhance the graphic rendering, as well as integrated models created in Cinema4D and real-time sound analysis from VDMX. Protocol between these nodes is maintained with Syphon. Build the Cities is a code-based generative music video directed and programmed by Raven Kwok for the track Build the Cities by Karma Fields Feat. Kerli Kõiv. The entire music video consists of multiple stages. The basic structure for each stage is a dynamic subdivided cubic cell, which is able to multiply based on a designated distribution pattern. For generating the animated singing figure (Kerli), the pattern is computed based on depth sequence of the original footage. Speaking of the footage, a Kinect, a camera, plus Depthkit were used to shoot both the RGB and depth footage simultaneously. Since Depthkit’s built-in visualizer was not used, an additional program was later developed by Kwok to sync the footage. For generating the cityscapes, Kwok programmed another separate generator to produce images of random aerial views of buildings, using brightness to indicate each block’s altitude. The images were later imported and read by the system the way similar as Kerli’s depth sequence. The mapping of the pattern is also affected by each host cubic cell’s “gravitation mode”, which changes the pattern’s facing direction. Benton C Bainbridge is a media artist based in the Bronx. Working with custom systems of his own design, Bainbridge creates immersive environments, interactive installations and digital time-based artworks. Bainbridge’s work has been presented on 5 continents, including showings at Whitney Museum of American Art, Museum of Modern Art, Lincoln Center, Museum of the Moving Image, American Museum of Natural History, The Kitchen, Frieze Art Fair (NYC), EMPAC (Troy, NY), SFMoMA (San Francisco), Hirshhorn Museum and Sculpture Garden (Washington, D.C.), Dallas Video Festival, Boston Cyberarts Festival, Mercat des les Flors (Barcelona), LUX2006 (Sevilla), Auditorium Parco della Musica (Roma), Sonic Light (Amsterdam), Wien Moderne (Vienna), Inventionen (Berlin), Teatro Colón CETC (Buenos Aires), CELCIT (Managua), International Horticultural Expo (Xi’an, China), Korean Festival (Seoul), Good Vibrations (Australia), and MTV Networks (global). Currently, Bainbridge is showing his latest media paintings at justasec.XYZ.